Broan's Pro-Style Outdoor hood is designed of brushed corrosion resistant stainless steel to ensure long life in outdoor patios or lanais, this hood will remain a beautiful addition to your outdoor kitchen for many years to come. The extra deep 27" design can be extended to 30" with the optional wall extension, allowing even greater cooktop coverage for better capture of smoke and cooking odors. 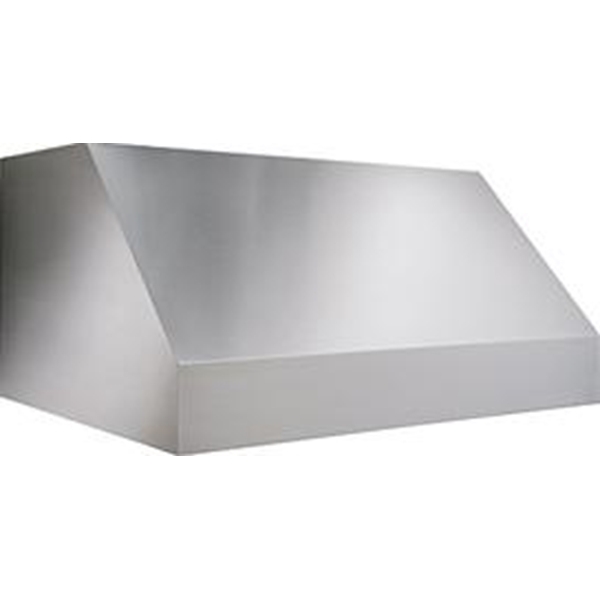 Flue covers are also available and attach to the top of the range hood shell. Flue covers come in 3 sizes to adapt to your specific design needs. Deeper flue covers are also available for hoods using the 3" wall extension. All of these attributes are what makes the Pro Outdoor the best in class for capture and performance. 18" tall wall-mount design with deep 27" depth to handle the heat and size of outdoor grills. Powerful 1100 CFM internal blower for quiet, dependable operation. 3-speed rotary control for convenient range of ventilation choices. 50-watt Halogen bulbs provide bright lighting (three in 48" not included). Professional style baffle filters capture grease typical to outdoor cooking,easy to remove grease rail makes clean up easier. Heat Sentry detects excessive heat and adjusts blower speed to high automatically to maintain optimum ventilation. Optional 3" wall extension for greater coverage, eliminates expensive custom wall bump-outs. Optional flue covers available to fit 8", 9" and 10" ceilings for standard or wall extension installation choices.